Coconut palm | Infonet Biovision Home. 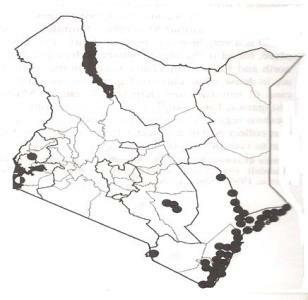 Digo (Mnazi); English (Coconut palm); Giriama (Mnazi); Luo (Naas); Kamba (Munathi); Swahili (Mnazi). The generic name seems to be derived from the Portuguese "coco", meaning "monkey".Is one of the world's most useful trees, of great economic importance due to its many important uses. Planting should be encouraged around Lake Victoria and in the western Rift Valley as a backyard tree or with other crops. In the coastal areas of the tropics and subtropics where it is grown, it requires a hot, moist climate and deep alluvial or loamy soil, thriving especially near the seaboard, but also considerable distance inland, provided climatic conditions and soil are suitable. Rocky, laterite or stagnant soils are unsuitable. Altitude: 520 - 900 m, Mean annual temperature: 20 - 28 deg. C, Mean annual rainfall: 1000 - 1500 mm, Soil type: C. nucifera is tolerant to soil variations but its natural preference is for sandy, well-aerated and well-drained soils. It has considerable ability to adapt to soils of heavier texture. Seedlings raised in trenches for four months before planting out. In good conditions at sea level it bears a first crop after 7 - 8 years. The tall varieties reproduce by cross-pollination. Male flowers open first, producing pollen for about 2 weeks. Female flowers are not usually receptive until about 3 weeks after the opening of the inflorescence, making cross-pollination the usual pattern. Wind is the main pollinating agent. Reproduction in dwarf varieties is generally through self -pollination. Female flowers are receptive about a week after the male flowers open, both ending at about the same time. C. nucifera flowers approximately after the 6th year. The outer husks, the "coir" of commerce, can be used for ropes, etc. The dried kernel is "copra" from which coconut oil and dried coconut are made. 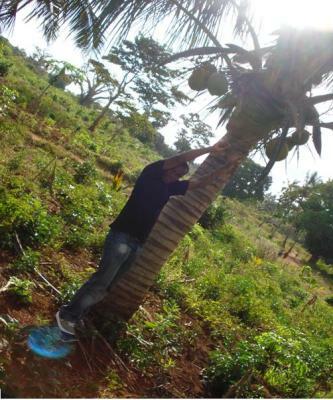 When at the flowering stage, the shoot can be tapped to make palm wine, which is also used as yeast for bread making. The Hispaniolan woodpecker, which attacks the trunk for nesting sites and damages immature nuts, and the village weaver, which strips the leaves for nest building forms part of the bird pests. Red-ring disease may be caused by the nematode Rhadinaphelenchus cocophilus which invades the stem and crown base. There are more than a hundred species of insects that afflict the tree. They include; rhinoceros beetle (Orycetes rhinoceras, O. moceros), coconut mite (Aceria guerreronis) and coconut weevil (Rhynchoporus cruentatus). Others include; Strategus spp. (attacking the softwood and the heart of the tree), Brontispa spp. (severely damaging leaves) and leaf miners (Promecotheca spp.) that render leaves non-functional. The most important disease of C. nucifera is lethal yellowing as it has killed hundreds of thousands of palm trees and endangering virtually all of the tall coconut palms. Lethal yellowing is said to be caused by a tiny mycoplasma-like organism, which visible only with the aid of an electron microscope. Initial symptoms are premature dropping of coconuts and blackening of the flower stalks. Antibiotic oxytetracycline may be injected and additional applications at 4-month intervals are required to keep the tree alive. Infected palms may be roughed and destroyed and replaced with the resistant Malayan Dwarf coconut palm. Bud rot, caused by the fungus Phytophthora palmivora, may be found in all areas where C. nucifera is grown. Early symptoms include; brown sunken spots, yellowing or withering of young leaves. The leaves turn a light greyish-brown, becoming darker brown as they drop off. The infection spreads inward to the bud and outward to surrounding leaves, which turn yellow and drop off. Young nuts fail to develop and fall, but those well-formed before infection continue to mature. The decaying bud emits a disagreeable odour. Disease development most commonly occurs after periods of heavy rains and early detection is essential for successful control. Application of a Bordeaux paste to the buds in early stages may result in recovery if the apical meristem is not infected. Remove fronds showing early symptoms. Palms showing advanced symptoms should be removed and destroyed, because they may serve as a source of inoculum.